Pest description and crop damage Several species may occur on raspberries. Mite infestations are less common on blackberries. Adult twospotted spider mites are about 2-3 mm long, have eight legs, and are light tan or greenish with a dark spot on each side of the back. Mite feeding reduces plant vigor and may cause leaves to turn brown and drop prematurely, reducing yield. Spider mite feeding is accompanied by webbing on the undersides of the leaves. Biology and life history Spider mites have four stages of development: egg, larva, nymph, and adult. Adults overwinter on canes or in plant debris. Warm temperatures significantly increase spider mite activity, and the entire life cycle may be completed in as little as 5 to 7 days under warm summer conditions. Therefore, there are many overlapping generations per year. Yellow spider mites are common early in the season in cooler temperatures. Mites do not fly but are blown from plant to plant, or are carried on plant material or equipment. On individual plants, they can walk from infested areas to new parts of the plant. Scouting and thresholds Infestations usually begin on lower leaves of plants, then progress upwards. Inspect oldest leaves first for stippling; webbing and the mites themselves can be found on the underside of leaves. Various natural enemies, such as ladybeetles, green lacewings, pirate and big-eyed bugs, help reduce spider mite populations. Beneficial predator mites are also naturally present in caneberry fields and are effective in controlling spider mites. Introducing commercially available beneficial arthropods (especially predator mites) has been shown to be effective. Follow supplier's recommendations. Spider mite populations are held down in cool conditions early in the season. Avoid early season applications of insecticides, which reduce populations of beneficial insects. Spider mite infestations are favored by dry, dusty conditions, so avoid creating these problems. Plant stress increases likelihood of infestations, so keep plants healthy and well watered. Excessive nitrogen fertilization may cause population buildup. If treatment is necessary, use selective materials, preferably insecticidal soap or insecticidal oil. Both petroleum-based horticultural oils and plant-based oils are acceptable. Don't use soaps or oils on water-stressed plants or when temperatures exceed 90°F. These materials may injure some plants, so check labels and/or test them out on a portion of the foliage several days before applying a full treatment. Oils and soaps must contact mites to kill them, so excellent coverage, especially on the undersides of leaves, is essential; repeat applications may be required. horticultural oil-Some formulations are OMRI-listed for organic use. insecticidal soap-May require several applications. Infestations that develop after September 1 are probably not worth controlling. Some formulations are OMRI-listed for organic use. 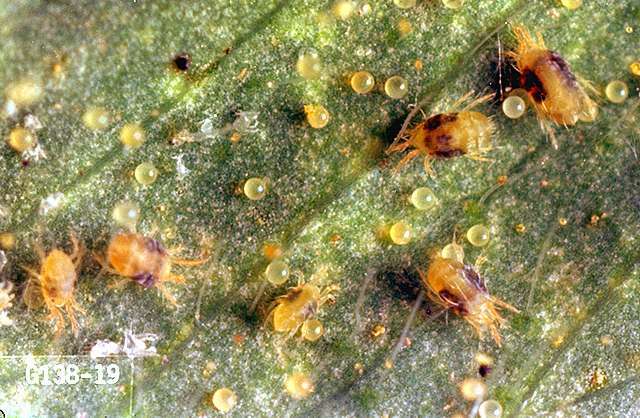 sulfur-Will suppress mite populations. Do not use sulfur above 90°F or within a month of an oil spray. Some formulations are OMRI-listed for organic use. abamectin (Agri-Mek) at 0.01 to 0.02 lb ai/a. PHI 7 days. Controls adults, nymphs, larvae, and eggs. acequinocyl (Kanemite) at 0.3 lb ai/a. PHI 1 day. Controls adults, nymphs, larvae, and eggs. Do not exceed 0.6 lb ai/a per season. bifenazate (Acramite 50WS) at 0.375 to 0.5 lb ai/a. PHI 1 day. Controls adults, nymphs, larvae, and eggs. etoxazole (Zeal) at 0.09 to 0.135 lb ai/a. PHI 1 day. Controls primarily larvae and eggs; not very effective against nymphs and adults. One application allowed per season. fenbutatin-oxide (Vendex 50WP) at 1 lb ai/a. PHI 3 days. Raspberries only. Controls larvae, nymphs and adults. Do not exceed one application per year. Label allows use in Washington and Oregon only. Restricted use pesticide. hexythiazox (Savey) at 0.125 to 0.1875 lb ai/a. PHI 3 days. Controls eggs, larvae and nymphs only; does not control adult mites. Do not exceed one application per crop season. insecticidal (M-Pede and other brands)-Consult label for rate. Controls adults, nymphs, larvae, and eggs. Some formulations are OMRI-listed for organic use. PHI 0 days.